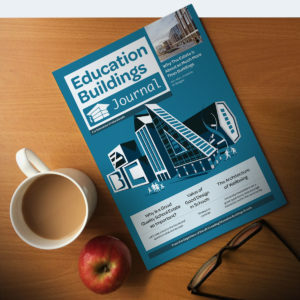 NEW Education Buildings Journal - June edition now available to view! Welcome to the first issue of Education Buildings Journal. It’s brimming with essential reading and is written for the industry by the industry – the education professionals. The UK’s education buildings and learning spaces vary greatly, with factors such as location, procurement, funding and specification all influencing the final results. However, the common theme throughout the industry, be it design, build, management or maintenance is that we all want the best learning environments for this generation of pupils as well as the next. The environment plays such an important part within a learner’s experience and their overall relationship with their education. With this is mind, we created this exciting new journal to provide you with topical insights and opinions from across the industry. Let’s deliver the next generation of education buildings and learning spaces so that all of our learners can achieve their full potential. To view your free copy CLICK HERE or click the image below. To request a copy of the next issue of Education Buildings Journal please complete the below form. In providing your contact information for Education Buildings Journal; you are giving your consent for Step Connect2 Ltd (publishers of Education Buildings Journal) to send to you & contact you about future Education Buildings Journals and our related education events. Should you wish to stop receiving the journal, or information about our events, you will have the option to easily unsubscribe from those emails and mailings you no longer wish to receive.